Did you catch my video on how you can easily remake recipes using what you already have in the house? It saves you time and money in the process. Plus you have a lot less food thrown out, and you get to have fun in the kitchen as well. Seriously, this is a game changer in your meal planning. Trust me on this. As proof of the fact that you can actually have it turn out successfully, here’s what I did with the recipe from the video. I not only overhauled the ingredients, but I also shaved off a huge amount of prep and cooking time as well. I want to credit the original recipe which can be found on The Purple Carrot. 1/2 head cauliflower (~400g) – Hey look! I actually kept an ingredient. LOL. It’s a main ingredient. Tread carefully removing a main ingredient as you probably want to keep at least one big thing in place. 4 cups (100g) kale, chopped instead of 8 oz brussels sprouts – Since you shred the sprouts, I figured it was close enough in texture to kale. 3 tsp minced garlic instead of 3 gloves garlic – I have to laugh that it says “gloves” of garlic. Heehee, my garlic isn’t fancy enough to wear gloves. 4 Tbsp (56g) sundried tomatoes instead of 2 Tbsp pine nuts – I opted for sundried tomatoes for a rustic Italian flavor theme. 2 Tbsp walnut oil instead of 4 Tbsp olive oil – I reduced the oil to bring down the calories a little and went with walnut to add a missing nut flavor from taking out the pine nuts. Removed the 1/2 cup of panko breadcrumbs completely – I briefly considered crushing Club crackers as a replacement, but decided to not use them at all. The toasted breadcrumbs were served on the side in the original, so I figured they wouldn’t be missed if I omitted them. 1/2 tsp crushed red pepper instead of 1/8 tsp red chili flakes – I had no clue what red chili flakes were but I figured crushed red pepper would do. Sounds spicy. 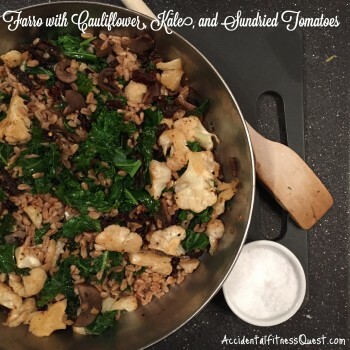 1 cup (166g) uncooked farro instead of 8 oz penne pasta – The Kid ate allllll the pasta so I went with the next best thing – farro which is a grain. I was also thinking that it was crunchier than pasta and would stand in well for the missing toasted breadcrumb texture. I read through the steps in the original recipe and saw a bunch of mashing, toasting, draining, reserving liquids. Yeah, that’s so not going to happen in the Quest Kitchen. I streamlined it quite a bit by nuking the cauliflower instead of boiling and reserving liquid. I also didn’t mash it as it cooked to make it creamy. I cut it into small florets and left them that way. The kale was already washed and chopped in the fridge from the weekend. Nothing to do or shred there. I didn’t have to toast nuts or breadcrumbs, since I went with sundried tomatoes. Instead of reserving liquid, I simply dumped in a little water as the veggies cooked to lightly steam them. Less dishes to worry about making dirty and an effort saver too. Here’s how it turned out… Quest Style! Cook the farro according to package directions. About 10 minutes before the farro is finished cooking, start on the remaining steps. Chop the cauliflower into florets and microwave for 5 – 6 minutes until softened. Heat a large pan over medium heat and spray with non-stick spray. Add the garlic and cook for about 1 minute until it starts to brown. Add the kale and sundried tomatoes along with about 1/3 cup of water. Saute for 3 – 4 minutes until the kale begins to wilt and the water evaporates. Add the cauliflower and heat for another minute or so until everything is crisp tender. Remove from heat. Stir in the cooked farro, crushed red pepper and walnut oil. Divide into bowls and enjoy. Makes 4 servings at approximately 280 calories each – 9g protein, 43g carbs, and 8g fat. Get a little crazy and sprinkle it with parmesan cheese! You can make this a hearty main dish on it’s own by eating two servings, or add grilled chicken or other protein and use this as your side dish. That’s how it’s done and no trip to the grocery store for a bunch of ingredients needed. Give this a try and see what creations you come up with. I’d love to hear about them. Don’t forget to subscribe to my YouTube channel so you get notified when new creations, tips, and kitchen craziness is posted.